Ernest Britten Page (1913-1966) was a well known character in Soho Cafés of the 50s and 60s. He was a “gifted and many-sided personality”, a popular astrologer, a poet, a social worker and the warden of a secret magical order. “The beloved Ernest was a gifted and many-sided personality: few, if any, knew all his counsels, but all that he did was distinguished by the exquisite and devoted care which was his especial characteristic. In Soho the fragile figure with the snow-white hair and beard was well-known, going through the narrow streets carrying a large leather bag in each hand (the one filled with astrological books and papers, the other with personal possessions) or presiding through the night at a quiet table in the corner of a crowded coffee-bar, drawing meticulous horoscopes and annotating them in his fine archaic script, checking the accuracy of his work by making quiet and often astounding observations on his client ‘s past life, sometimes spending an hour or more sifting the evidence for a particular time of birth: and all for a most nominal fee, or for no fee at all if he so decided: this work, like everything else, he did for the love of it. His forecasts, when he made them, were accurate to a high degree: for besides his astrological knowledge he possessed a deep intuitive perception to which, however, he never laid claim. Besides these gifts he was also a skilled graphologist and a talented lyrical poet: but above all, the people who came to see him on account of his fame as a Soho ‘ ‘character,” lingered in crowds around his table for the sake of the talk. Writers, artists, philosophers were drawn into it: with Soho’s habitués of all kinds, men, women, the old, the young, the ambitious, the derelict. In 1959, Ernest became the warden of a magical order, Ordo Sacri Verbi (Hermetic Order of the Sacred Word). The formation of the Order of the Sacred Word is described in Book I of The Magical Philosophy . In essence, it was formed in 1957 as an offshoot from an older hermetic order called Aurum Solis. 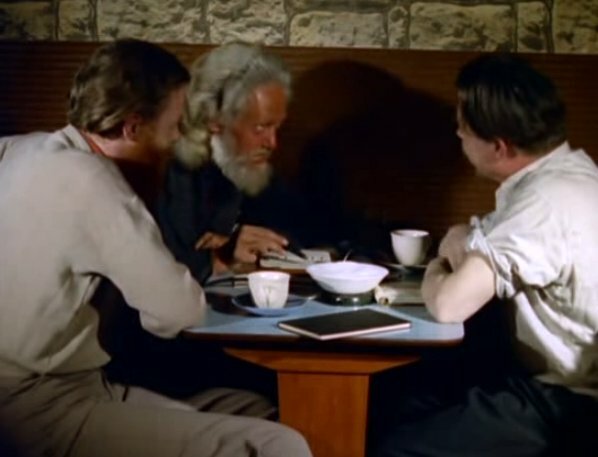 Ernest worked towards the reunion of the Order with Aurum Solis, but this reunion was only achieved in 1971, after Ernest’s death. Ernest was a keen poet. A short verse of his appears in The Magical Philosophy . Another, The Waif, is presented in the Ogdoadic Journal  with notes on the poem, both in relation to his work with the Simon Community, and also the esoteric meaning of the poem. The Adocentyn website has an article on his poetry, and says: “Within the archives of the Astrum Sophia are contained some of his additional works, including the simply titled XIV Poems and a rare, delicately hand-bound booklet of poetry from Page’s involvement with a group of British poets known as The Saturdays.” The site also includes a poem by Ernest: The Bridge, and one about him: The Astrologer, by Arthur Jacobs. The description of Ernest and the history of the Aurum Solis and Ordo Sacri Verbi is given in Appendix D to Book I of The Magical Philosophy, Robe and Ring by Melita Denning and Osborne Phillips, published 1974 by Llewellyn Publications, Minnesota, USA. The poem is in Book III of The Magical Philosophy, The Sword & the Serpent, by Melita Denning and Osborne Phillips, pp. 170-171. I am astounded to have refound Ernest Page after so many years! Thanks for your comment! Did you know Ernest? Any memories to share? Yes I did know him from about 1959 until his death (which I am certain was actually later than 1966). I saw a lot of him – and was devastated when he predicted his own death. Ernest was not easily forgotten. Before he took to wandering he worked for the Post office, in a sorting office (I think Paddington). I would usually meet up with him at Sam Widges coffee bar then go walk about with him, often joined by “Angel” a tall ladyboy prostitute. Thanks for your comment Ian. How did you know Ernest? I’d love to hear any other memories you have of him. I first met him when I was stationed at Preston barracks in Brighton, I would hitch to Soho every weekend and doss about in all night cafes like the Nucleus, SamWidges, and the 2 Gs (Gyre and Gimble). As he was basically doing the same we teamed up, I got in the habit of carry his case. Although he was gay and I am hetro he was never predatory, many never even realised. Angel often joined us, an AngloIndian ladyboy and prostitute . Hi Ian – I , too, was around in Soho in the 50s/early 60s and worked in the Nucleus and various other clubs, cafes etc. Ernest was, of course a regular face in many of them. Sam Widges was on of my favourite places to hang out, mainly for the jazz jukebox. I also knew Angel, and would occasionally wander through Soho with her. I was only about 15 or 16 at the time and she was very nice to me. Until recetly I have never met anyone who remembered her. She made a big impresson on me as a young teenager, she was a very nice person. I would love to have any more information on her, general life in Soho stuff, and whatever became of her? I, too, was heterosexual, and although I worked in, amongst other places, the famous gay As You Like It, I never had any problems with the gay community. In those days everyone seemed friendly and accepting no matter what your background, sexual orientation, etc. Or, maybe, I was just lucky to meet friendly, interesting people. I get very saddened when I walk around Soho nowadays and see the changes and destruction of such a unique area with so much history. Were you aware that Angel was born in India? Quite a few years later, perhaps early 60s, when I was living in the Portobello road area I was having breakfast in a local cafe when I was hailed by name by one of 4 men sitting at a table. I did not recognise any of them but the man who had hailed me said it is Angel, don’t you remember me. I was in shock, he had reverted to a very trendy man, complete with facial hair. I am so pleased to have found this page after searching all over the Internet this evening. I am sitting with my Grandfather Roger, he asked if I could look on the Internet to see if anything can be found on an old fellow he used to know – Ernest Page. My grandfather lived opposite Ernest, he believes it was Wingfield house / lodge Highgate hill. They met frequently at a tea room, he remembered he had a friend called Stanley. My grandfather has a letter from Ernest once apologising for not being able to come for tea.. He remembered he worked at the post office and was a poet. He thinks he had a hunch back and my grandparents helped Ernest in a time of need when he did not seem to have anything other than I bed to sleep in. My grandfather has always wondered what happened to him after losing contact 40+ years ago. My grandfather tells me he has a book of unpublished poems by Ernest, he was most impressed my Ernest’s handwriting. Ernest did an astrological horizon for my grandfather who was/is a writer and artist. I hope these snippets of information help with your history of Ernest, Roger is moved to haven found him and his photograph. Thanks Harry and Roger – I have copies of some of Ernest’s poems as well, so maybe we can exchange some. I will email you.